•	Interactive make-your-own furry friend retail-entertainment experience. •	Give the gift of FUN! •	Give a fun experience and friend they’ll always remember. 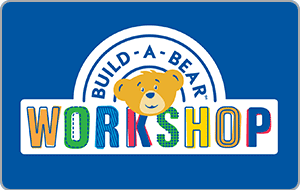 To check available balance go to buildabear.com, call (toll free) 1-888-566-4977 or visit a store near you. For a store near you visit our website or call (toll free) 1-866-262-2327. No value until activated. Time to reward yourself! Check out gift cards below, or browse all available merchants.